A range of vehicle performance products for serious drivers, racers and car enthusiasts everywhere. We manufacture and sell state of the art automotive performance measuring tools that accurately measure your car's performance: acceleration, power output, torque and handling and more. There are thousands of our Dyno products in use worldwide. Unlike some similar products, these are accurately calibrated and temperature compensated professional tools. Using measurements on moving cars is how manufacturers set up cars. The results are often more accurate than rolling road measurements as the effects of real acceleration on fuel flow etc, and airflow over the engine are measured. And after all, road performance is what you're really interested in, isn't it? Our original dyno - since it's launch we've sold 1000's all over the world. Road Dyno is used by everyone from racers, car enthusiasts, professional tuners, bikers, scale model racers to car manufacturers! From 1HP to over 1000HP! Road Dyno is also great for fault finding engine and ignition problems. This low cost dyno measures the entire power band of a vehicle from 1000rpm - redline, and provides a power/torque on the road graphs and printed output. Data is stored in internal flash memory. Easily used with cars, bikes, and most diesels. weekend. The dyno works very well and gives excellent results." This unit comprises a multiple axis precision accelerometer housed in a small battery powered case which is easily located in any vehicle. Internal memory stores 5 minutes of test data. Acceleration is sampled at over 100 times per second, accurate to 0.005. With the included Road Acceleration Conversion Engine software (RACE) it provides an unparalleled level of performance data at a low cost. 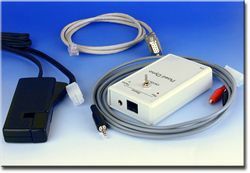 Data Logger version now available - 4 channels of digital data and 7 channels of analogue data plus a tacho input! Also available as a factory upgrade to Dyno Plus. 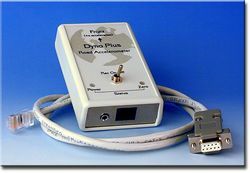 data from the dyno plus"
DynoStar is a unique and powerful combination of INS (inertial navigational systems), a high performance GPS receiver and powerful data logging with 3D flexible graphics displays. 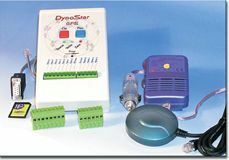 DynoStar measures the entire performance of a vehicle continuously from the INS and GPS data, and automatically maps racetrack, road etc, as you drive. DynoStar's powerful processing and display software gives you detailed measurements of acceleration, power, torque, speed and RPM and logged information (such as throttle position, air/fuel ratio, temperature, etc) plotted against time, track position or distance. Developed from a professional rally instrument, there's no other product that offers so much information for the price!